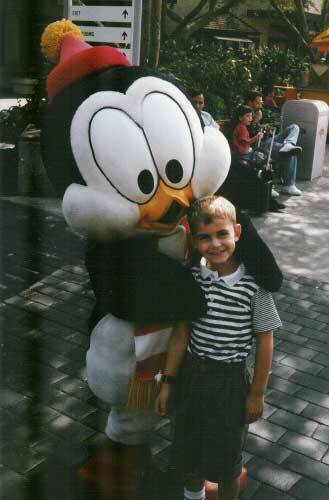 Then, Janzow asked if I’d like to go to Universal Studios. 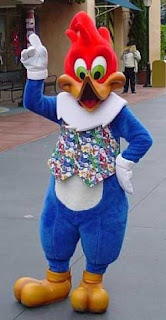 Shafton, Inc., after all, was connected to the park and he, as caretaker of the Walter Lantz character costumes—Woody Woodpecker, Andy Panda and Chilly Willy being the studio’s prerequisite walking animated stars of choice—had free access, which included any guests. Hm… Let’s see… return to my motel where I might be able to make the afternoon Mah Jong game on the veranda with Norma, Hedy and Marlene, sipping mint juleps, or free admission to a huge theme park with über-awesome rides…? Minutes later, Janzow was leading me through an employee entrance into Universal Studios, where we were greeted by—appropriately enough—Woody Woodpecker, shaking hands (or is that feathers?) with what appeared to be a school trip. A school trip?!! Jeez, growing up in Boston, the field trips consisted of some colonial house, ship, cemetery or church. If the class was lucky, it was the aquarium. Screw history! Give me mindless fun!!! Having helped me gain access to the park, Janzow took his leave to return to the factory. 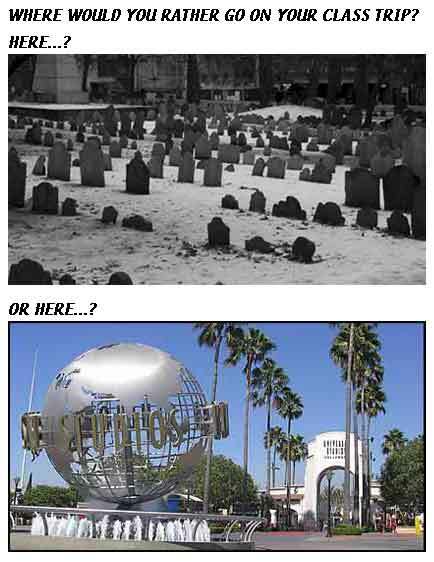 As much as it would have been nice to have company, especially a studio insider who could provide oodles of interesting facts and anecdotes about the park, I was strangely jazzed about exploring Universal Studios unfettered. Years on the open road, gigging in both remote and major locations around the U.S., Canada and England, had inured me to loneliness. My life was basically a succession of spaghetti-western roles—à la Clint Eastwood in a Sergio Leone flick—only with happy fans in my wake instead of dead bodies. And I’m sure there were more than a few appearances where I left a local scratching their head, wondering, Who was that masked man? Despite the beautiful afternoon—sunny and dry—the park was relatively quiet. Yes, it was a weekday, but it was also the height of summer. Yet, if it weren’t for the school group, Woody would have been left unappreciated. I felt compelled to greet him myself, once the students had dispersed. I’m sure there are few “adults” who don’t secretly want to shake hands—or sit on the lap, as is Santa Claus’s case—with the costumed characters they bring their children to meet, but refrain due to having an audience of peers in attendance. 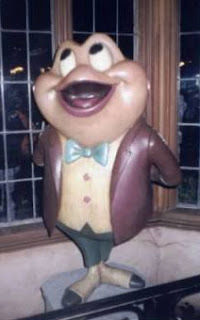 I have no such qualms, but in such an instance, I did find myself more ebullient in my reaction, hugging Walter Lantz’s most famous creation and slapping him five as I bid him a fond adieu. As I walked away, all I could think was, He must be dying in there! I then proceeded to the “Back to the Future” ride. Janzow had informed me that this was the hottest ride in the park, though the line would suggest otherwise. I would later learn that given the park’s dearth of visitors—there seemed to be more people strolling the mall in Dawn of the Dead… living people, that is—Janzow was not disingenuous with his information. Still, I was dubious. Signs reading, “You must be over this line,” and others warning those with weak hearts to forego the amusement frequented the labyrinthine queue like Burma Shave billboards on the highways of bygone America. I had to smile at the former, wondering if Michael J. Fox—notoriously small in stature—would have qualified to participate on the ride inspired by his own hit film. I soon cottoned to the reason for the amusement’s popularity, which stemmed less from the lingering adoration of the movie than from its nature. 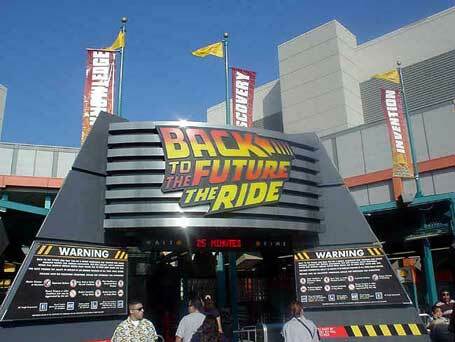 The “Back to the Future” ride was a virtual experience, one of the first of its kind. As such, it was unlike traditional rides, where a vehicle propels you in some direction, whether that be circuitously on a track, like a roller coaster; or along a path through a constructed landscape, like the “Pirates of the Caribbean” ride; or simply around, up-and-down, or oscillating pendulum-like, as on a carousel, the teacups or Tilt-a-Whirl. Rather, riders on “Back to the Future” remain seated before a huge screen, on which is played a first person viewpoint adventure that fills the entirety of rider’s perspective, fooling their brains into thinking they are experiencing everything firsthand. Rocking, lifting, shaking and vibrating occur in conjunction with the on-screen happenings to further heighten the participant’s feeling of being a player in the action. I found the whole experience annoying. Ninety-percent of the time, the virtual effects hoodwinked me about as much as the “ladies” on Rupaul’s Drag Race. The few times I did find myself drawn into the adventure, I started getting motion sickness. Meanwhile, the surrounding participants were squealing like Ned Beatty in Deliverance. Surely, those were screams of anguish over wasting their time on this lackluster ride. Nope. Laughter accompanied the squeals as they raced toward the exit blathering, “Let’s go on it again!” Don’t wait for me! I had been on one other virtual ride prior—The Funstastic World of Hanna-Barbera at Universal Studios Orlando—a far superior amusement wherein the audience helps Yogi Bear rescue Elroy Jetson from the clutches of Dastardly and Muttley. During the adventure, riders are supposedly seated in a space vessel piloted by Yogi who chases the diabolical duo in another ship. He may be “smarter than the average bear,” but his flying skills are on par with Woodstock’s. 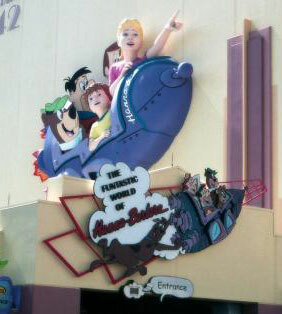 The ship careens through a haunted mansion, where it runs into, and nearly runs into, Scooby-Doo, Shaggy and several famous ghouls from the series; gets shunted back in time, where the pursuit continues through the streets of Bedrock, almost colliding with Fred and Barney on their way to Slate Gravel Company; and finally shoots into the future of The Jetsons, where Yogi finally succeeds in retrieving Elroy. Oddly, the virtual aspect of the ride was more effective than that in “Back to the Future.” And not a hint of motion sickness. The story? What a hoot! I busted a gut whipping through the various worlds of Hanna-Barbera. Maybe I’m part cartoon myself (Don’t answer that!). After all, I consider Bugs Bunny one of my earliest influences. Fortunately, the other rides at Universal Studios were more in keeping with the types of amusements I favor: more actual, less virtual. I’d enjoyed the amusements inspired by Earthquake, Jaws and King Kong at the park’s Orlando location in years past, but that didn’t lessen my excitement in experiencing them again. My favorite, by far, is the one featuring Willis O’Brien’s “eighth wonder of the world.” I have ever been a lover of giant monsters. From Godzilla to Gamera, Rodan to Reptilicus; from Valley of the Gwangi to War of the Gargantuas; whether reality-based or fabricated, if it’s over-sized, I like it. And as one of moviedom’s first, King Kong holds pride of place on my list of favorites. The ride duly honors the resident of Skull Island. Eager riders queue against a New York City subway backdrop. The ride’s makers take liberties in their representation of the Big Apple’s world-famous underground transportation system. Some are for aesthetic reasons, such as the omission of trash, rats, bible thumpers, the homeless and the hypnotic aroma of stale urine. Others further the amusement’s plot, like the special news reports warning of King Kong’s proximity to Manhattan, delivered by monitors sporadically hung along the waiting area. The NYC subway’s communication system is notorious among patrons as being terrible or non-existent. True, the situation has improved in the decades since I first moved to the Big Apple, but a foot’s being twelve times more than an inch only sounds good when one is not aware that a mile is needed in order to get the job done. So the presence of televisions—never mind clearly audible and discernible ones—alerting passengers of emergencies, is laughable (Actually, the fact that people are traveling through the NYCT subway tunnels in order to get to the Roosevelt Island Tram is ludicrous, but…). Still, the preponderance of screens featuring the recurring warnings—like something out of 1984—about the imminent approach of King Kong is unsettling and gets the riders’ hearts pumping. 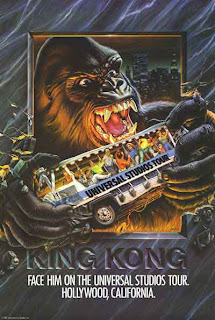 Once seated in “the tram,” passengers ascend over a New York City ravaged by the awesome ape. Warnings continue over the PA system, but once the tram is in motion, there is no turning back. Suddenly, Kong appears through a canyon of buildings. The giant robotic gorilla created for the ride is amazing. Knowing it is nothing more than a construct, doesn’t assuage the adrenaline coursing through the veins of the passengers. Kong presses within feet of the car, his arms raised to grab it, seconds before power is restored and the tram slips through the ape’s grasp. As the tram continues on its way, passengers discover that the Giant gorilla is not to be denied. He bursts through Manhattan’s towering edifices in hot pursuit, this time succeeding in ripping the tram from its cable. 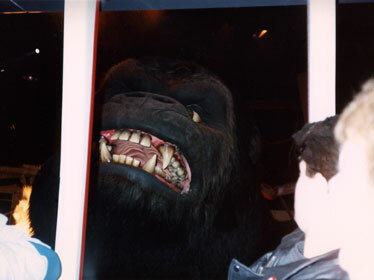 More than a few screams emanated from the car’s occupants, as the vehicle oscillated in Kong’s wake. The arrival of several military helicopters finally scare off the beast and the car limps onward to the finish. Two opposable thumbs up! As the late afternoon sun descended upon the horizon, I returned to my lodgings in hopes of catching the early-bird buffet and a round or two of Bingo. Actually, I decided to soothe my jet-, costume- and theme-park–lagged bones in the cement pond that the motel promoted as a pool in its brochures. Unsurprisingly, the pool area was empty. Lucky for me; I don’t think two people could comfortably fit in its confines. As it was, I merely floated about, enjoying the refreshing cool temps of the water—secreted behind a wrought-iron fence all but hidden by bushes and creeping vines that did little to mask the rush-hour traffic just beyond—and digging the odd tableau. My trip was near completion. After tomorrow’s final fitting—a formality to guarantee that Janzow made the necessary adjustments to the Thing and Iron Man outfits—I would drive back to San Diego, where I was to meet my gal, the wondrous and adorable Audrey. We’d enjoy a few days together before my debut as the Ever-Lovin’ Blue-Eyed member of the Fantastic Four at the San Diego ComicCon. Vroom, have you checked out Star Trek the Experience when it was in Vegas? Way cool.